Imagine being able to make a positive difference in people’s lives across the United States through therapy animal visitations for those in need. Whether the visit recipient is someone going through a frightening medical procedure, has been admitted to hospice, is a soldier is returning from a long-term deployment, or a child learning to read, often these individuals face uncertainty, pain or loneliness. 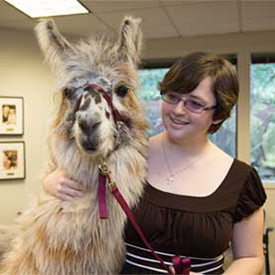 A visit with a therapy animal team offers a unique interaction opportunity with a healthy dose of joy, comfort and feelings of happiness. You can help us to ensure these visits continue to happen through your legacy gift to Pet Partners. Please join the many committed individuals who have made this important decision a philanthropic priority, recognizing that their estate will one day make a great difference in the lives of others. The information on this site does not constitute legal or financial advice. We encourage you to discuss these options with your financial advisors to determine the best choice for you. We encourage you to let us know if you decide to include Pet Partners in your estate plan. Sharing this information will enable us to welcome you into our Caring Community, designed to honor those who have chosen to leave a legacy gift to Pet Partners. As a member of the Caring Community, you visibly demonstrate your personal commitment of support for Pet Partner’s mission of promoting positive human-animal interactions, and in so doing, inspire generosity in others. We thank you for your consideration and look forward to hearing from you. There are many ways you can leave a legacy to Pet Partners. Explore the content below to learn how different opportunities may be beneficial to your situation. Bequests to a charity like Pet Partners are the most popular type of planned gift. You retain assets during your lifetime and then leave a bequest to the charity. We hope you will consider including a gift to Pet Partners through your Will. It’s easy to do by adding a few sentences to your Will. You decide how much to leave to Pet Partners, whether it is a specific amount or a percentage. You also have the added advantage that if your estate is subject to an estate tax, your gift is entitled to an estate tax deduction. The correct legal name to include in your Will is Pet Partners. Our Tax ID is # 91-1158281. I give to Pet Partners, located in Bellevue, WA, Tax ID # 91-1158281, the sum of $_______ or _______% of my estate for Pet Partners general purposes. Please let us help you with your sample gift language to Pet Partners. We will assist you or your attorney with bequest language that works best for you and us, and can also clarify and advise you in regard to your interest in benefiting specific aspects of our work. Often times life insurance is purchased and then decades later, may not be needed for its original reason such as providing for children who are now adults. If your heir(s) are no longer dependent on you and you have a paid up policy, consider changing the beneficiary of your life insurance policy to Pet Partners. Contact the company that holds your life insurance policy and name Pet Partners, Tax ID #91-1158281 as the beneficiary. A Payable on Death account (POA) is a common way to keep monetary assets out of the probate system. It is arranged when the bank or credit union account holder gives the bank directions to transfer remaining funds (for a certificate of deposit account or on a bank account) to a nonprofit such as Pet Partners upon death of the account holder. They are easy to create, there is no limitation of the amount of money that can be transferred and you may include multiple beneficiaries. A CRT is a trust that is arranged to provide a specified distribution that happens at least annually, to one or more beneficiaries. Generally these irrevocable trusts are arranged using a significant amount of funds. There are advantages of establishing a CRT; after the trust has been funded, you are able to take an income tax deduction and spread the value of your contribution over multiple years. Since the property that you put in the trust will go to the charity outright upon your death, the property will not be included in your estate for the purposes of determining your estate tax. Finally, a CRT allows you to turn property that isn’t producing income into cash without paying a tax on the profits gained. A charitable lead trust (CLT) is designed to provide income to a nonprofit like Pet Partners for a term of years, with the remaining assets at the end of the term, retained by the donor or a family member. It has the advantage of providing a gift to charity for a length of time, receiving a tax break and then eventually leaving the assets to family members. The charity benefits by receiving an income stream for a number of years, and the benefit to you is that the assets that remain that are designated to your family can be transferred free of federal and estate tax. Since most retirement plans are income tax-deferred, the tax becomes payable when this asset is received by individual beneficiaries, such a family member. When a nonprofit is named as the beneficiary of an IRA or retirement account, there are no income taxes due upon death. This makes an IRA and other retirement accounts a sensible way to leave a future gift to Pet Partners. To change a beneficiary on an account to include Pet Partners, contact your plan administrator. For other ways to help, please visit our Annual Fund, Fundraising Events, and Get Your Company Involved, pages.